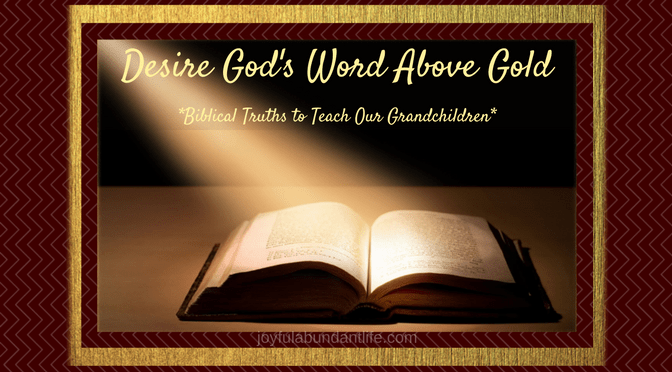 >> Instilling Biblical Truths Into My Grandchildren – What is your Greatest Desire? Instilling Biblical Truths Into My Grandchildren – What is your Greatest Desire? What’s your greatest desire? Money? Fame? Fun? Happiness? Friends? All of the mentioned and more? What would you put on the list? There is one great desire that we all ought to have and I want my grandchildren to realize it while they are young. How thrilled I was when I received a gold ring or another piece of gold jewelry from my husband. (Here are reasons why I know I married the right man) It was something that was thrilling for a long time. It was something I wanted to show everyone. I wanted everyone to know who it came from and how much he loved me! God, himself, offers me so much more than the finest treasures. God’s Word is more desirable than gold And right now I have it at my fingertips every day to be read, meditated on, and shared with others. Wow! Yet, how often I treat it as if it were just another “piece of costume jewelry to throw in my jewelry box”, something I will just use once in a while. It should not be that way. It is far more precious than gold. It is something that money could never buy. Oh how I want my grandchildren to realize that! Psalms 19:7-11 The law of the LORD is perfect, converting the soul: the testimony of the LORD is sure, making wise the simple. The statutes of the LORD are right, rejoicing the heart: the commandment of the LORD is pure, enlightening the eyes. The fear of the LORD is clean, enduring for ever: the judgments of the LORD are true and righteous altogether. Desire God’s Word because it is something you can give or share. Just as we can give or share our “gold” when possible, we have God’s Word to share with others. As we share it we can tell others about the special gift (here’s how you can have 5 free gifts) God has offered them through His Son Jesus Christ. Desire God’s Word because it is something you can save. Just as you can save your “gold” for future needs, you can save God’s Word by hiding it in your heart and keeping it forever there. No one can ever take it from you and there is always more than enough for future needs. It is sure and steadfast and makes you wise. It is right and just and rejoices the heart. It is pure and enlightens the eyes; it give insight for life. It is clean and endures forever. It is true and righteous. It is sweeter than honey and the honeycomb. It rewards us greatly when we obey what it says. All the gold in the world can’t match up to this! Isaiah 40:8 The grass withereth, the flower fadeth: but the word of our God shall stand for ever. Yes, what immeasurable treasures we have through God’s Word! Praise God!